Semi Coiling Machine makes Coil from insulated wire/cable. It is not fully automatic so its called semi coiling machine. Bumra Industrial Corporation offers Automatic Wire Drawing Machines, which are most suitable and known for their best performance in the field of wire drawing. We bring forth a compendious range of Dad Block Coilers for our clients. Our range finds application in various industries for different purposes. Moreover, these products are fabricated in accordance with clients’ specifications to fulfill varied industrial requirements. Oprat Height: 1100mm. Former Front, Plate on Ball Catch Lock for Quick Removal. We are offering a premium quality collection of Semi Auto Dual Coiler Machine to our customers. Also, customers can avail these machines at competitive prices. We have wide experience in manufacturing and supplying wide range of Electrical wire Coiling Machine. 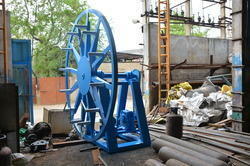 Our offered products tube coiling machine for mining industry. We offer our products in market with minimum price and low maintenance. 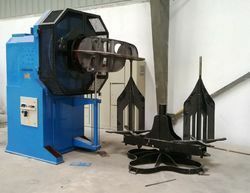 We are involved in providing the wide range of Wire De Coiling Machine.It is highly durable and has excellent quality. It is available at the market leading prices. We specialize in offering a superior range of Stress Relieving Furnace to our clients. Our range is especially designed for stress relieving of P. C. wires, single and stranded wires. We also provide cutting machine off straightening wire to our clients as per their requirement. Furthermore, we meet the bulk demand of our clients within a given time line across the globe. Matching up with the ever increasing requirements of the customers, our company offers excellent quality of Wire Cable Auto Coiler Machine.